Traders work on the floor of the New York Stock Exchange (NYSE) in New York, U.S., September 8, 2017. 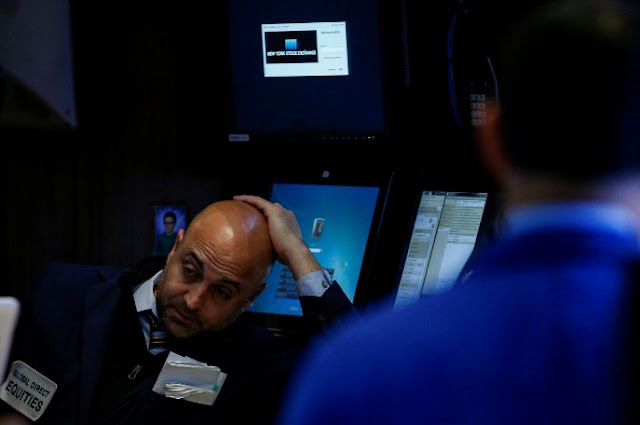 U.S. stocks were set to open lower on Thursday, a day after closing at record highs, as shares of Apple remained under pressure and an uptick in consumer prices inflation boosted the odds of another interest rate hike this year. A Labor Department report showed consumer price index (CPI) rose more than expected last month and the gain was the largest in seven months, lifting the year-on-year increase to 1.9 percent from 1.7 percent in July. Still, both consumer prices and personal consumption expenditures, the Federal Reserve’s preferred inflation measure, remain stuck below its 2-percent target. “I don’t think they should raise rates in December, but they will, in order to counteract any kind of slowdown in the overall economy,” said Robert Pavlik, chief market strategist at Boston Private Wealth. The chances of a rate hike in December rose to 50.9 percent from 41.3 percent before the release of the data, according to CME Group’s FedWatch tool. The CPI data is the last to be released before the Fed’s Sept. 19-20 policy meeting, where it is expected to outline a program to start offloading its $4.2 trillion balance sheet. At 8:39 a.m. ET (1239 GMT), Dow e-minis 1YMc1 were down 24 points, or 0.11 percent, with 6,898 contracts changing hands. S&P 500 e-minis ESc1 were down 5 points, or 0.2 percent, with 64,441 contracts traded. Nasdaq 100 e-minis NQc1 were down 24.75 points, or 0.41 percent, on volume of 7,772 contracts. Oil prices also built on recent gains after the International Energy Agency forecast stronger demand. “People are mindful that the storm’s caused an upside pressure on price of energy, I think they are taking that in stride,” said Pavlik. Apple’s shares were down 0.5 percent in premarket trading, set to extend a 0.8 percent drop from Wednesday on concerns about the pricing and delayed availability of the newly launched iPhone X.
Hertz Global dropped 6.10 percent after Morgan Stanley downgraded the car rental company’s stock. Tenet Healthcare was up 8.25 percent after Reuters reported the hospital operator was exploring strategic alternatives, including a sale. United Natural Foods rose 6.2 percent after reporting better-than-expected profit and providing upbeat forecast.